The Mastigoteuthis species occur throughout much of the Atlantic, Indian and Pacific Oceans. At present we are confident of the separate species status of only two species: M. agassizii and M. psychrophila. However, character variation through the wide range of the group is apparent (see Comments) and we suspect that eventually more species will prove to be valid. At present we refer to the tropical to temperate Indo-Pacific member as M. dentata, to the south temperate, tropical to boreal Atlantic member as M. agassizii (see the M. agassizii page for more details), and to the high-latitude southern form found in at least the South Atlantic and South Pacific as M. psychrophila. numerous, small but easily seen integumental photophores. Arms III ca. 20% larger than arms I and approximately equal to arms II. Arm suckers largest near arm base. Club suckers vary in size and packing density depending on position on club; proximal and marginal suckers smallest. 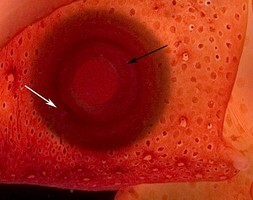 Largest club suckers 0.15-0.2 mm in diameter in large (about 80 mm ML or more) squids. Funnel locking-apparatus ear-shaped with tragus but with or without antitragus; posterior margin of funnel lock deeply undercut. Fin length (without tail) generally 55-65% ML; slightly broader than long. Tubercules absent from the integument. Integument with numerous, small (easily visible under the microscope) photophores. 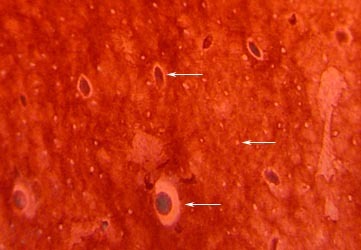 The integument of species in the M. agassizii-group is complex and contains two elements in addition to the integumental photophores: (1) very small, whitish balls and (2) whitish rings surrounding chromatophores. Since the function of these two structures is unknown (we suspect that the latter may be a second category of integumental photophores), we call the first "white balls" and the second "ringed chromatophores" for descriptive purposes. Integument with chromatophores well sparated from one another (= scattered chromatophores). Integument of the arms and head with numerous, very small (ca. 0.03 mm), white spheres (function unknown). Figure. 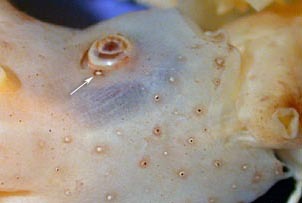 Ventral view of the head integument of M. agassizii, Gulf of Mexico, showing typical integumental photophores (bottom arrow) which lie deeply embedded in the skin, ringed chromatophores (top arrow) and white spheres. Non-ringed chromatophores are absent and most of the pigment is not in chromatophores. Photograph by R. Young. Eyelid with very small eyelid photophore but, generally, distinctly larger than large integumental photophores of head. More information on integumental photophores can be found here. Integumental photophores are found in at least four species, but their morphology has only been studied in M. agassizii. 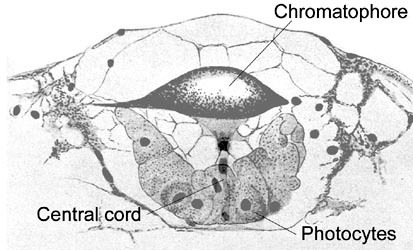 The photophore has a large covering chromatophore that lies beneath vacuolated cells, a thick donut-shaped cup of photocytes and a central cord of cells that passes through the hole in the photocyte donut to the chromatophore. Figure. Composite longitudinal section through an integumental photophore of M. agassizii. Drawing modified from Chun (1910). The integumental phototophores of the M. agassizii-group appear superficially to be very similar to those of Mastigotragus pyrodes. However, the vacuolated cells above the covering chromatophore in M. agassizii give the impression that the photophore is sunken into the skin. Mastigotragus pyrodes also differs in lacking the ringed chromatophores and white spheres and has much more abundant chromatophores. Figure. Comparison of the head integument of M. agassizii and Mastigotragus pyrodes; ventral view. Black arrows point to integumental photophores, white arrows point to ringed chromatophores and white spheres. Note the much more abundant chromatophores in Mastigotragus pyrodes. Photograph by R. Young. Outer rings of club suckers have a complete whorl of pegs with lateral pegs enlarged in some species. The presence and size of enlarged lateral pegs depends on the absolute size of the sucker. Sucker size, howsever can vary with age and sucker position on the club. Smaller suckers are found proximally, distally at extreme tip and marginally on the club. Generally, the lateral pegs become enlarged at a sucker diameter of about 0.15 mm. Therefore if a large squid (ca. 80 mm ML or more) does not develop suckers of this size or larger, as in M. psychrophila, enlarged lateral pegs will not occur. This character is very important but is only useful in large squid. Figure. Oral views of different regions of the same club of M. dentata, 135 mm ML, mature male, Equatorial Pacific, 5°53'N, 150°01'W, showing positional effects on sucker size and packing density. 1 - Proximal region. 2 - Midregion. 3 - Distal region. Photograph by R. Young. Figure. Oral view of suckers of M. dentata, 135 mm ML, mature male, Equatorial Pacific. Left - Sucker from distal region of the club. Right - Sucker from the proximal region of the club. 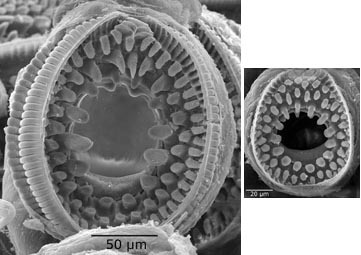 Large differences exist in sucker sizes and relative sizes of the lateral pegs of the inner whorl. Scanning electron micrographs by R. Young. The funnel locking-apparatus of all three species. The club suckers of all three species. The photophore patterns of all three species. We have placed three species, M. flammea, M. grimaldii and M. schmidti, in synonymy with M. agassizii. See the M. agassizii page for more information on these species. Page: Tree of Life Mastigoteuthis Verrill, 1881. Authored by Richard E. Young and Michael Vecchione. The TEXT of this page is licensed under the Creative Commons Attribution-NonCommercial License - Version 3.0. Note that images and other media featured on this page are each governed by their own license, and they may or may not be available for reuse. Click on an image or a media link to access the media data window, which provides the relevant licensing information. For the general terms and conditions of ToL material reuse and redistribution, please see the Tree of Life Copyright Policies.